This news just landed on our science/technology desk, which we'll be filing under 'Futuristic Nightmares'. Still, it's a social upgrade, we guess, however much of a nuisance it promises to be. They're using their technological prowess to put a new spin on an old nuisance, the parking meter. I love the picture that came with the news release, showing a parking meter obviously very tricked out, pimped out for the future of collecting parking receipts and ticket fines. We'll be longing for the old days, that's for sure, when it was more hit and miss, when the meter maid had to actually catch you with the minutes left expired. This happened to me the other day. I was at a restaurant, then suddenly realized my meter might be on zero. I left the french fries on the table, grabbed my hamburger and drink, and went running. But, thankfully, I still had 12 minutes left, but no french fries. In the brave new world of the future, according to what the engineers and designers are saying, I guess I could check on my iPod how many minutes I have left. That'd be good. But if I don't check, then it goes down to zero, it'll be an automatic fine. No leeway, no grace period, no hoping the meter maid is helping a guy work off his fines in a cheap motel somewhere. 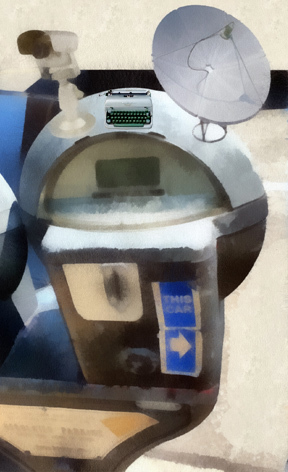 Who knows what apparatus might be tightly wound inside the parking meter proper? I'm sure it has bundles of wires, various computer chips, and transducers. I can't know about that. I'm just looking at the stuff on the external surface, and that's keeping me occupied for the present moment. There's a rotating camera that does something, no doubt, probably keeping track of something, beneficial, one would assume, toward whatever purpose it is designed for. Security, I would guess, to make sure no one steals the satellite dish. Which we need to look at, because this is the heart of the new technology, regulating the whole works by satellite. It's beaming data from the meter to the satellite in space and perhaps to local parking officials at the space station. It knows precisely when the time is supposed to run out, triggering what is next. What is next -- and this is going to be controversial -- is that installed in all cars somewhere under the windshield wipers and hood will be a printer and a roll of blank parking tickets. When the satellite detects the time nearing zero, like in the last couple minutes, it'll start printing the ticket, which then zips up its track and ends up under your windshield wiper. What happens if you're arriving in the last couple minutes, maybe that's what the TV camera is for; maybe it spots you, by facial and physique recognition, and immediately triggers the satellite to show a zero on the display. Because how are you going to know? The other thing I see mounted on top of the meter is a very small manual typewriter. What that's for, I'm trying to guess. Maybe if you wanted to type something it'd come in handy. And if you had a toothpick to push the keys, I suppose you could do it. Who knows, it could be they expect you to type up your own ticket if the printer jams. And if you try to drive away instead the camera will get you. The whole concept is going to be controversial. Meter maids, of course, won't like it a bit, since they'll be out of a job. Then there's the rest of us, and I already hate it.